The discharge-petition amnesty — and the resulting furious splits within the GOP — was planned and triggered by a Californian Democratic legislator, according to a nugget buried in a Politico report. The article gives the credit to Democrat Rep. Pete Aguilar for creating the discharge petition fight, which wasted two months of time needed by the GOP’s leadership, and which gave the establishment media two months to produce handwringing articles and videos about ‘DACA’ illegals, GOP splits, conservative “hardliners,” and backroom negotiations. The Democrat’s office had spent hours researching an obscure legislative procedure known as a discharge petition. There was a way, he told Denham, that the two of them could do an end run around [House Speaker Paul] Ryan — all they needed was 218 signatures to force votes on bills of their choosing. If Aguilar could bring along all 193 Democrats, Denham would need to peel off only 25 Republicans. Aguilar is a member of the Democrats’ pro-amnesty Hispanic Caucus, and his role as instigator contradicts the narrative used by establishment media — that the entire fight was a revolt by GOP “moderates” and “centrists” against a do-nothing crowd of anti-amnesty hardliners. 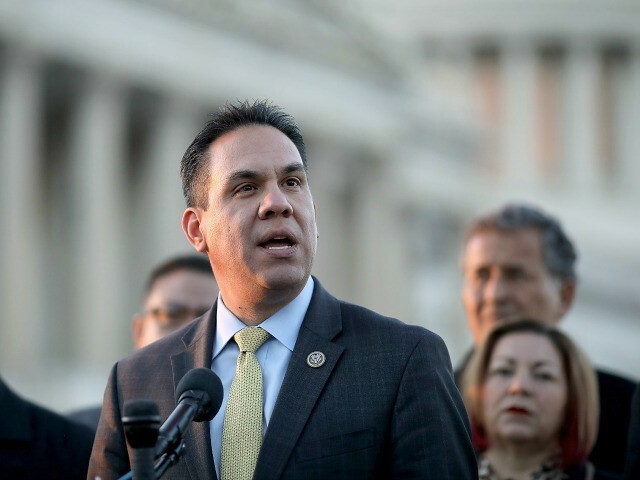 Rep. Pete Aguilar (D-CA), speaks at a press conference outside the U.S. Capitol with other members of the Hispanic caucus on March 5, 2018 in Washington, DC. based on interviews with more than 20 lawmakers and staffers who were intimately involved in negotiations over the past month-and-a-half. However, the article has a few giant holes. A. The article does not discuss corporate lobbying for the amnesty, not the role of GOP donors. Their role was likely huge, but in the end, their donations were trumped by the voters who want a pro-American immigration reform, not another cheap-labor, wage-cutting amnesty. Throughout the debate, Breitbart covered the role of donors, including the American Action Network, and a Florida network of donors who threatened to close their checkbooks unless Speaker Ryan endorsed an amnesty. Breitbart also showed that amnesty bill which emerged from the backroom negotiation over the discharge-petition was pushed by the U.S. Chamber of Commerce, even though it was opposed by several other business groups because it trimmed the current inflow of legal immigrants. B. The article sidelines the polling on immigration, even though lobbyists and media reporters routinely tout the skewed “Nation of Immigrants” push-to tout apparent voter support for amnesty, immigration, and immigrants. In reality, the alternative “Choice” polls reveal most voters’ often-ignored preference that CEOs should hire Americans at decent wages before hiring migrants. Those Americans include many blue-collar Blacks, Latinos, and people who hide their opinions from pollsters. Similarly, the 2018 polls show that GOP voters are far more concerned about migration — more properly, the economics of migration — than they are concerned about illegal migration and MS-13, taxes, or the return of Rep. Nancy Pelosi. Much of the evidence in the public record suggests that Ryan allowed Aguilar’s discharge-amnesty plan to pressure GOP conservatives and moderates into accepting the amnesty which Ryan eventually brokered with the GOP’s business-first wing, including Denham and the Florida Rep. Carlos Curbelo. For example, Ryan could have blocked the discharge-amnesty push at a very early stage by threatening to block donations and promotions for Denham, Curbelo and any other GOP legislators who signed the discharge petition. Politico noted that Ryan only began to apply pressure to Denham and the discharge-petition GOP legislators when he wanted to wrap up negotiations by the weekend of the June 9. “It was around that time that GOP leaders picked up their effort to stop the petition,” said Politico. 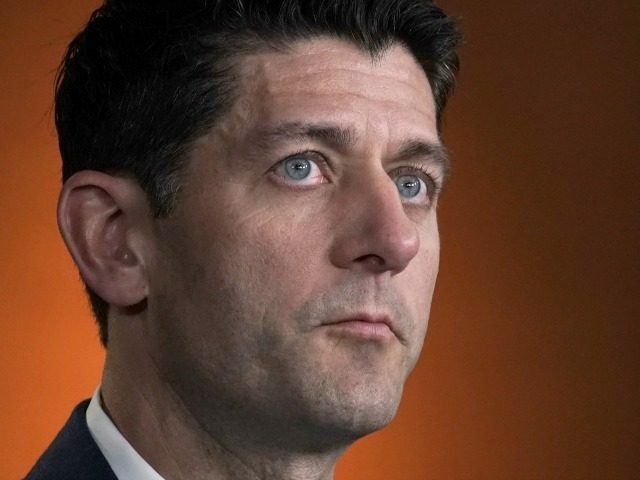 In the end, Ryan’s amnesty bill crashed on June 27, getting support from just 121 Republicans and opposition from 112 Republicans. Rep. Carlos Curbelo, a Cuban-American from Miami who had warned Ryan for months that he might back a discharge petition to secure an immigration vote if the speaker didn’t schedule one himself. Curbelo’s political backers in Florida are ignored by Bade. E. The role of agriculture-state GOP legislators is another hole in Bade’s story. They were the largest faction in the group of GOP discharge-petition legislators. Their priority seemed to be getting more cheap migrant-labor for their districts’ low-tech, cash-strapped dairy farmers, the only apparent benefit they gained from the fight was a promise by Ryan to hold a vote on the very controversial H-2C guest-worker program. But they did get a lot of good press from the amnesty-friendly media which normally sides with Democrats. In contrast, conservatives argue that Ryan — and his donors — deserve the blame for the entire fiasco because he did not push the original compromise bill which had been drafted by Rep. Bob Goodlatte, the chairman of the House judiciary committee. That bill won 193 GOP yes votes, and only 41 GOP no votes, in a June 21 floor debate. With some pressure and promise from the top leadership, that bill could have passed, say mainstream Republicans. That unhappiness — plus the wasted time — suggests that the big winner from the entire episode was the Democratic instigator, Rep. Pete Aguilar. Unless, of course, Denham, Curbelo and the other amnesty signers get reelected in November and give President Donald Trump a huge 2018 victory.